Papillon Center proudly welcomes Heather White, PA-C as our new Hormone Specialist and Physician Assistant (PA). Heather was specially chosen after a 2 year search of excellent PA candidates. She brings her advanced experience (see Heather's full CV) in hormone research to the center and has quickly become a key link in the Papillon Center chain of care. She earned her PA degree at Dr. McGinn’s alma mater, The Philadelphia College of Osteopathic Medicine. PCOM is renowned for its integration of a holistic philosophy in patient care training. 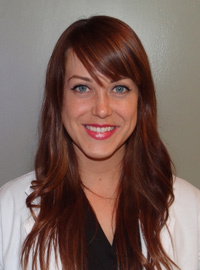 As the demand for Dr. McGinn's unique expertise has soared over the past few years, Heather has been strategically positioned as her highly-trained assistant in order to continue to deliver expert care to an ever growing community. Heather will be assisting in routine office visits, the operating room, at community education events and in hospital rounds. Under the direct supervision of Dr. McGinn, she will streamline the Contra-Hormone Therapy (CHT) program at the center in order to increase patient volume without sacrificing the "BOUTIQUE CARE" Papillon Center is known for. Please join us in welcoming Heather to the practice.